So you've decided to be an astronomer! You are not alone; although it is something you can do by yourself. Since the beginning of time those small pinpoints of light have mesmerized us. Not too long ago I decided to learn the basics of beginning astronomy. Since you can get very scientific information with measurements and mathematical statistics from so many talented sources including MANY of the members in our club, I'm going to give YOU - the beginner - the very basics you need to not feel overwhelmed by astronomical information. Most of the things I'm going to tell you are done without binoculars or telescopes so don't feel you can't do astronomy without those things. First let me tell you that any member to whom you talk at a club meeting or star party or outreach is willing to help you learn. My advice is to listen and try to absorb what's being said. Think of each bit of information you learn as a block. You stack them up one at a time, climbing higher and higher toward those stars that are calling to you. Next, get a journal or notebook, scribble your name and title it, and start your own Star Book. Every time you go outside at night or right after you come in write down descriptions, locations, and draw what you saw. (Line drawings are perfect; you don't need to be an artist to do this). Make sure you note where it is in the sky by E – W – N – S or NW. Include the time, date and how far up from the horizon it was. The Sky is always changing both seasonally and nightly so depending on the time you look and what time of year it is there will be different stars to look at. The stars move nightly across the sky from east to west (because the earth is turning counter clockwise), except a central hub of stars to the NORTH which are visible all year long this group of stars are called North circumpolar constellations, Polaris the north star and is the only stationary star because it is directly above the earths axis. Think of the earth like a big ball with a stick going thru the middle of it. Hold your hand on one end of the stick and put the other on the ground. Now turn the stick so the ball is spinning. Think of your hand as the star Polaris its at the top and doesn't move. The stars closest to Polaris that form a circle around Polaris move more slowly because they too are very close to the top of the ball and your hand. Now, north circumpolar constellation doesn’t seem like such a hard thing to remember. A constellation is a grouping of stars that make an imaginary shape. The ancient Greeks named the ones we are familiar with after mythological characters, people, animals and objects. In different parts of the world, people have made up different shapes out of the same groups of bright stars. It is like a game of connecting the dots. In the past creating imaginary images out of stars became useful for navigating at night and for keeping track of the seasons. We have 88 constellations. The constellations that seem to rotate around Polaris are Ursa Major (the great bear) Ursa Minor (the little bear) and Cassiopeia (the Queen of Ethiopia). Inside constellations are common shapes and patterns, which are called asterisms. These patterns are easy to find when you look up and help you located constellations and stars in the night sky. In Cassiopeia you will see a W or M pattern depending on which way the constellation is turned. 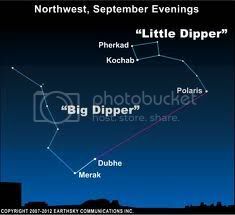 In Ursa Major you will see the Big Dipper and in Ursa Minor you will see the little Dipper. Polaris is found at the end of the handle of the little Dipper, which is harder to see in the sky because some of the stars are fainter. So find the Big Dipper in the north sky imagine a line drawn across the outermost two stars in the "cup" of the dipper, and extend this line about 5 times the distance between those two stars. The imaginary line points almost exactly at Polaris. Because Polaris doesn't move, seafarers used it to guide them home and once you know where it is you will always be able to find north at night. Polaris is not a particularly bright star although it is the brightest star in the little dipper. In fact Polaris is actually a double star (two stars that share gravity and rotate around each other) Actually there is a third star caught up in this gravity which means it’s really a triple star but its very small and farther away. It is also a variable star, which means depending what day you’re looking at it, it will be a little brighter or dimmer. You can't see the second star with your naked eyes but if you get a chance to look at Polaris in a telescope you will see that that one twinkling star is actually two really close to each other. I'm going to over the next few months write in this topic information that you can use to help you when you go outside at night. My advice is don't try and read all of it at once and if you have questions feel free to ask no matter how simple you think it is. If I don't know the answer I can assure you someone in this club will or we will find out! So the astronomy bug has bitten you and you've become familiar with the northern sky. It's time to turn your back to the north for now to see what the rest of the night sky can offer you. So you've arrived to the long lazy days of summer. To astronomers it means different things. Shorter nights and hot hazy evenings give rise to bugs and clouds making looking at the summer sky less reliable and there ARE plenty of things in the summer sky to look at even without binoculars or a telescope. Stars are given ratings to show how bright they are. This is called their magnitude. Brightness of stars are assigned a number starting with the brightest star starting at about -1 magnitude. Dimmer stars are zero or positive numbers. The larger the number means the dimmer the star is. For example, a magnitude -1 star is brighter than a magnitude 0 star. A magnitude 0 star is brighter than a magnitude 1 star. A magnitude 1 star is brighter than a magnitude 2 star. A magnitude 4 star is brighter than a magnitude 5 star. Magnitude sequence for stars starting with the brightest is -1, 0, 1, 2, 3, 4, 5, 6, 7, 8, 9, 10 magnitude, ... etc. Three brilliant stars form this stellar right triangle making it our best heavenly landmark in the summer night sky. Vega high above and its western point appears the brightest of the three. Deneb, also high above and to the east of Vega, appears the dimmest. Altair shines below in the south, forming the most distant point of this great triad. These three stunning stars are an unofficial star group or asterism that link the three constellations ... Lyra, Cygnus the Swan and Aquila the Eagle. This Summer Triangle lies high above, over the Milky Way, which now sweeps across the heavens from north to south. The biggest treat in the summer sky is the Milky Way itself. On a clear evening that double stripe of hazy clouds that arch over your head from north to south is not wispy cloud but our own galaxy spiraling away from us almost edge on. You see our solar system is on one of the outer arms of our galaxy so we not only get the treat of seeing outside our own galaxy we also get to look back to the heart of ours in all its splendor. All that milky haze is the glow of billions of stars in our own galaxy and if you have binoculars and you focus in on that stripe of white you will begin to realize just how many stars make up that white glow. To locate Lyra and Vega, look overhead and look for a little lopsided rectangle with a triangle attached. It almost looks more like a kite with a tail. Vega is interesting because of its relationship with Polaris (See you remember that star!) We already know that Polaris lies very close to the earth's axis. Well, the earth wobbles on its axis every 26,000 years or so; when the earth wobbles back in another 12,000 or so years Vega will become our new north star. Our second Summer Triangle star, Deneb, is the tail of Cygnus the Swan. Deneb and four other bright stars of the Swan form an asterism called the Northern Cross, which is immersed in the Milky Way. 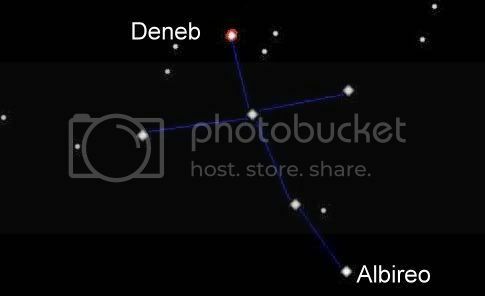 Deneb is at the top of the cross, the star Albireo is at the base. Albireo is a double star famous for its rich colors of orange and blue (A true gator star!). The star pair can be split with binoculars, but the colors can be seen only through a telescope. Farther south on the Milky Way is the bright star Altair and its parent constellation, Aquila the Eagle. Depicted as an eagle, Aquila is named for the bird that belonged to Zeus. If you follow the Milky Way from Aquila toward the southern horizon, you should find a group of stars that looks like a teapot. This asterism is part of Sagittarius the Archer. This constellation marks the location of our galaxy's center. There are many more summer constellations but baby steps, Remember the old adage “Can't see the forest for the trees.” If you look for too many things you'll get overwhelmed. So what have we learned to look for in Summer. Here's your list.